In recent years, there has been an explosion of research trying to understand misinformation: what it is, how it operates, and what impacts it has on the world. On the surface, this roiling field seems to produce as many paradoxes and conflicting results as it does potential insights. For example, some studies suggest that bots (internet robots) play a limited role, whereas other studies suggest that bots drive the diffusion of misinformation. It is ironic that the field of research on misinformation has come to resemble the very thing it studies. What is true? What is actually known about misinformation and its impacts on society? A single research paper may interrogate only one aspect of what is a complex misinformation machine, making it tempting to see other papers as providing competing views, when they are, in fact, often entirely complementary windows into a much larger process. Grinberg et al. illustrate the necessity of thinking of misinformation as a process. Grinberg et al. show that online, mostly political misinformation is shared and seen by only a very small fraction of Twitter users...to small communities that engage with questionable media sources. To do this, they used a clever method to find humans (as opposed to bots) on Twitter: They matched U.S. voter registration records against Twitter accounts. Each Twitter user's political orientation was then estimated using the celebrity and news accounts they followed. There is a key blind spot in the current research: rumors. Although there has been work on the broad phenomenon of rumoring online and its connection to misinformation, there is a serious need for a better understanding of how fake news stories transform into rumors and to what extent these rumors can amplify beliefs and infiltrate other communities. Progress here might help explain one of the most curious and unexplained findings of the Grinberg et al. paper: that conservatives are significantly more inclined to share and see fake news than liberals. Perhaps this is the whole story: Conservatives have a weakness for fake news. More likely, though, is that liberals embed misinformation in different ways and spread it through means that we, as of now, do not have reliable ways of measuring. When we begin to uncover these mechanisms, it will be important to place them within the context of the much larger misinformation system within which they operate. Legend - This schematic is intended to summarize much of what this paper has tried to communicate. It shows an “inverted u” relationship between entropy and cognition such that too high a value implies high flexibility but high disorder, whereas too low a value implies ordered but inflexible cognition. 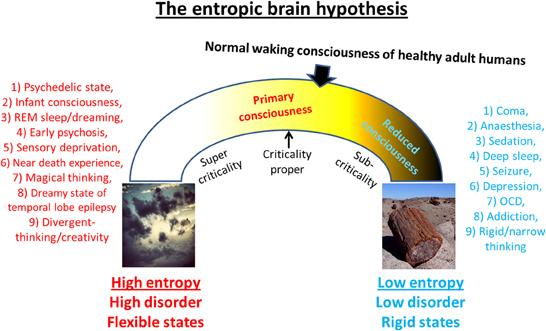 It is proposed that normal waking consciousness inhabits a position that is close to criticality but slightly sub-critical and primary states move brain activity and associated cognition toward a state of increased system entropy i.e., brain activity becomes more random and cognition becomes more flexible. It is proposed that primary states may actually be closer to criticality proper than secondary consciousness/normal waking consciousness. Homo Prospectus - the brain as a time traveler - augmentation by A.I.? Steve Johnson does an engaging article on the discovery and significance of the default mode network of our brains, which has been the subject of numerous MindBlog posts. This system recruits association cortices of the brain that are the last to become fully operational and our brain development continues through early adulthood, into our 20s. It is central to our internal mind wandering between past, present, and future. Accurate weather forecasting is merely one early triumph of software-based time travel: algorithms that allow us to peer into the future in ways that were impossible just a few decades ago...In machine-learning systems, algorithms can be trained to generate remarkably accurate predictions of future events by combing through vast repositories of data from past events. An algorithm might be trained to predict future mortgage defaults by analyzing thousands of home purchases and the financial profiles of the buyers, testing its hypotheses by tracking which of those buyers ultimately defaulted. TODAY, IT SEEMS, mind-wandering is under attack from all sides. It’s a common complaint that our compulsive use of smartphones is destroying our ability to focus. But seen through the lens of Homo prospectus, ubiquitous computing poses a different kind of threat: Having a network-connected supercomputer in your pocket at all times gives you too much to focus on. It cuts into your mind-wandering time. The downtime between cognitively active tasks that once led to REST states can now be filled with Instagram, or Nasdaq updates, or podcasts. We have Twitter timelines instead of time travel. At the same time, a society-wide vogue for “mindfulness” encourages us to be in the moment, to think of nothing at all instead of letting our thoughts wander. Search YouTube, and there are hundreds of meditation videos teaching you how to stop your mind from doing what it does naturally. The Homo prospectus theory suggests that, if anything, we need to carve out time in our schedule — and perhaps even in our schools — to let minds drift. According to Marcus Raichle at Washington University, it may not be too late to repair whatever damage we may have done to our prospective powers. A few early studies suggest that the neurons implicated in the default network have genetic profiles that are often associated with long-term brain plasticity, that most treasured of neural attributes. “The brain’s default-mode network appears to preserve the capacity for plasticity into adulthood,” he told me. Plasticity, of course, is just another way of saying that the network can learn new tricks. If these new studies pan out, our mind-wandering skills will not have been locked into place in our childhood. We can get better at daydreaming, if we give ourselves the time to do it. What will happen to our own time-traveling powers as we come to rely more on the prediction machines of A.I.? The outcome may be terrifying, or liberating, or some strange hybrid of the two. Right now it seems inevitable that A.I. will transform our prospective powers in meaningful new ways, for better or for worse. But it would be nice to think that all the technology that helped us understand the default network in the first place also ended up pushing us back to our roots: giving our minds more time to wander, to slip the surly bonds of now, to be out of the moment. Social networks explain academic success and failure. Understanding the factors that explain academic failure and success of university students is a core interest of educational researchers, teachers, and managers. We demonstrate how the dynamic social networks that informally evolve between students can affect their academic performance. We closely followed the emergence of multiple social networks within a cohort of 226 undergraduate university students. They were strangers to each other on their first day at university, but developed densely knit social networks through time. We show that functional studying relationships tended to evolve from informal friendship relations. In a critical examination period after one year, these networks proved to be crucial: Socially isolated students had significantly lower examination grades and were more likely to drop out of university. Academic success of students has been explained with a variety of individual and socioeconomic factors. Social networks that informally emerge within student communities can have an additional effect on their achievement. However, this effect of social ties is difficult to measure and quantify, because social networks are multidimensional and dynamically evolving within the educational context. We repeatedly surveyed a cohort of 226 engineering undergraduates between their first day at university and a crucial examination at the end of the academic year. We investigate how social networks emerge between previously unacquainted students and how integration in these networks explains academic success. Our study measures multiple important dimensions of social ties between students: their positive interactions, friendships, and studying relations. By using statistical models for dynamic network data, we are able to investigate the processes of social network formation in the cohort. We find that friendship ties informally evolve into studying relationships over the academic year. This process is crucial, as studying together with others, in turn, has a strong impact on students’ success at the examination. The results are robust to individual differences in socioeconomic background factors and to various indirect measures of cognitive abilities, such as prior academic achievement and being perceived as smart by other students. The findings underline the importance of understanding social network dynamics in educational settings. They call for the creation of university environments promoting the development of positive relationships in pursuit of academic success. Can psychological scientists make the world a better place? Psychological science is a multifaceted “hub science”, relevant and connected to many other disciplines. Rapid technological advances have enabled scientists to measure psychological phenomena from bodily responses invisible to the human eye through broad group behavior in large societies and then apply these findings to real-world issues to enhance human well-being and enact real-world behavioral and policy changes. Yet despite this remarkable progress, critical global issues face our society that call for immediate attention and action from psychological scientists. For example, within the past decade, we have seen escalating rates of serious and costly mental-health challenges in young adults and concurrent failure to provide mental-health treatment to those who need it the most; increases in self-reported loneliness and isolation that may compromise physical and mental health; high rates of sexual harassment and incivility toward women in the workplace and in science itself; political policy decisions that actively harm vulnerable children and their parents seeking refuge and a better life; seeming lack of concern for the welfare of many sentient nonhuman species; and rapid environmental degradation and climate change. In the face of these and other ominous challenges, we argue that the time is ripe for our field to engage more deeply with societal issues. As a discipline that intersects with many other disciplines and with the public directly, psychological science is well positioned to contribute to cultivating a healthier, happier, and more sustainable world. The passing of governance to corporate oligarchies serving the top 10%? Three recent articles suggest to me a direction for our future. Bret Stephens' article describes the U.S. and Great Britain as rudderless and scarcely able to govern themselves, never mind shape world order. Several other Western democracies are facing crises in governance. Into this void steps Larry Fink (the chief of BlackRock and the world's biggest investor) whose annual letter lectures corporations that it is now their duty to look beyond profits, and contribute to society, serving a social purpose. The mega-corporations that dominate the U.S. and international capital flows are now a more stable buffer against chaos that any individual governments. BUT, ultimately who do these titans serve? Not the top 0.1%, but, as matthew stewart documents in excruciating detail, a more broad aristocracy, in America the top 9.9%. His article presents a mind-numbing list of the hundreds of ways, both through legal and social customs, that the meritocratic class has mastered the old trick of consolidating wealth and passing privilege along at the expense of other people's children. Upstairs/ Downstairs in our Brain - Who (or what) is running our show? Upstairs/Downstairs - Who or what is running our show? I. What is happening as our “I” acts and senses in the world? A. Our subjective “I” is predictions that are late to sensing and acting. C. We can place our experienced body inside or outside our actual one. D. The “I” or self that we experience is an illusion, a virtual avatar in our brain. II. What behaviors are coming from upstairs and downstairs? A. Downstairs dominates rapid actions and judgements. B. Upstairs modulates this with slower reasoned responses. C. Reasons and emotions cause each other. D. Different personality types have different upstairs profiles. III. What is happening in paying attention versus mind wandering? A. Mind wandering is a transient loss of mental autonomy. B. Mind wandering and default mode networks stabilize our self model. C. Mind wandering facilitates creative incubation. D. A wandering mind can be an unhappy mind. IV. How might we observe and influence what our brains are doing? B. Attention training, like training for other skills, causes brain changes. C. Attention training can allow more autonomy in choosing actions and emotions, making us more pilot than passenger of our ship. -about 4 percent of children worldwide now die by the age of 5. That’s still horrifying, but it’s down from 19 percent in 1960 and 7 percent in 2003. -nine out of 10 Americans say in polls that global poverty is worsening or staying the same, when in fact the most important trend in the world is arguably a huge reduction in poverty... in the early 1980s, 44 percent of the world’s population lived in extreme poverty (defined as less than about $2 a person per day). Now, fewer than 10 percent of the world’s population lives in extreme poverty, as adjusted for inflation. Different meditation practices differently buffer from stress. Mindfulness practices are increasingly being utilized as a method for cultivating well-being. The term mindfulness is often used as an umbrella for a variety of different practices and many mindfulness-based interventions (MBIs) contain multiple styles of practice. Despite the diversity of practices within MBIs, few studies have investigated whether constituent practices produce specific effects. We randomized 156 undergraduates to one of four brief practices: breath awareness, loving-kindness, gratitude, or to an attention control condition. We assessed practice effects on affect following brief training, and effects on affect and behavior after provocation with a stressor (i.e., Cold pressor test). Results indicate that gratitude training significantly improved positive affect compared to breath awareness (d = 0.58) and loving-kindness led to significantly greater reductions in implicit negative affect compared to the control condition (d = 0.59) immediately after brief practice. In spite of gains in positive affect, the gratitude group demonstrated increased reactivity to the stressor, reporting the CPT as significantly more aversive than the control condition (d = 0.46) and showing significantly greater increases in negative affect compared to the breath awareness, loving-kindness, and control groups (ds = 0.55, 0.60, 0.65, respectively). Greater gains in implicit positive affect following gratitude training predicted decreased post-stressor likability ratings of novel neutral faces compared to breath awareness, loving-kindness, and control groups (ds = - 0.39, -0.40, -0.33, respectively) as well. Moreover, the gratitude group was significantly less likely to donate time than the loving-kindness group in an ecologically valid opportunity to provide unrewarded support. These data suggest that different styles of contemplative practice may produce different effects in the context of brief, introductory practice and these differences may be heightened by stress. Implications for the study of contemplative practices are discussed. Does meditation provide the only way to survive our brain-dissolving technological and political environment? ...not an escape from reality. It is getting in touch with reality…Without the focus and clarity provided by this practice, I could not have written Sapiens or Homo Deus…Over the millennia humans have developed hundreds of meditation techniques, which differ in their principles and effectiveness….but in principle meditation is any method for the direct observation of one’s own mind…Serious meditation demands a tremendous amount of discipline…If we are willing to make efforts to understand foreign cultures, unknown species, and distant planets, it might be worth working just as hard in order to understand our own minds. And we had better understand our minds before the algorithms make our minds up for us…For a few more years or decades, we still have a choice. If we make the effort, we can still investigate who we really are. But if we want to make use of this opportunity, we had better do it now. ...the subject of countless books, podcasts, conferences, a million-dollar app war. It’s extolled by C.E.O.s and entertainers and even taught in my kids’ elementary school (again, it’s Northern California). The fad is backed by reams of scientific research showing the benefits of mindfulness for your physical and mental health — how even short-term stints improve your attention span and your ability to focus, your memory, and other cognitive functions. After decades of swimming in the frenetic digital waters, I found that my mind was often too scrambled to accommodate much focus. Sitting calmly, quietly and attempting to sharpen my thoughts on the present moment was excruciating...about four months ago, I brute-forced it: I made meditation part of my morning routine and made myself stick with it. I started with 10 minutes a day, then built up to 15, 20, then 30. Eventually, something clicked, and the benefits became noticeable, and then remarkable. The illusion of multitasking improves performance. Real world demonstration of how tribes determine opinions. Real-world tests of the impact of partisan cues on voters are scarce because they require assessing how citizens’ attitudes changed toward an issue from before to after it became politically divisive. During the 2015–2016 New Zealand flag referendums, the leader of the (center-right) National Party and then–Prime Minister, John Key, championed changing the flag—a move strongly contested by the (center-left) Labour Party. Accordingly, we measured New Zealanders’ attitudes toward changing the flag using national longitudinal panel data collected in 2013, before the change was proposed, and again in 2016 at the height of the debate (Ns = 6,793–6,806). Registered voters who supported the National Party were more likely to shift from opposing to supporting the flag change, whereas those who supported the Labour Party were more likely to shift from supporting to opposing the change. These data demonstrate the powerful impact of partisan cues on political attitudes in a real-world setting. So... the actual title of the article by Di Bernardi et al. is "Right temporal alpha oscillations as a neural mechanism for inhibiting obvious associations" - but as you see from the abstract, this translates to describing a brain stimulation procedure for inhibiting habitual thinking and associations to enhance novel thinking. The trick is to induce right temporal lobe alpha (10 HZ) oscillations. I'm sure DIY kits to perform the procedure will be on the market soon. Entering 'alpha wave stimulator' in google search points to crude alpha enhancing devices that work through electrodes attached to the ears, claimed to relieve pain, control anxiety, fight depression, or treat insomnia. “Taking a less-traveled path” is often considered an effective approach to creativity (i.e., creative thinking calls for a break from habitual thinking and associations), yet little is known about its underlying neural mechanism. In a series of four independent experiments involving electrophysiological and brain stimulation methods we provide evidence that this process is mediated by the right temporal alpha oscillations. Alpha oscillations are known to represent a process of active inhibition to suppress irrelevant information, such as inhibiting distractions during visual search. Through monitoring the brain’s electrical activity during different creativity tasks and by stimulating the right temporal brain region at the alpha frequency we show that a similar process of active inhibition is also key to creative thinking. Creative cognition requires mental exploration of remotely connected concepts while suppressing dominant ones. Across four experiments using different samples of participants, we provide evidence that right temporal alpha oscillations play a crucial role in inhibiting habitual thinking modes, thereby paving the way for accessing more remote ideas. In the first experiment, participants completed the compound remote associate task (RAT) in three separate sessions: during right temporal alpha (10 Hz) transcranial alternating current brain stimulation (tACS), left temporal alpha tACS, and sham tACS. Participants performed better under right tACS only on RAT items in which two of the three words shared misleading semantic associations. In the second experiment, we measured EEG while the participants solved RAT items with or without shared misleading associations. We observed an increase in right temporal alpha power when participants correctly solved RAT items with misleading semantic associations. The third experiment demonstrated that while solving divergent thinking tasks participants came up with more remote ideas when stimulated by right temporal alpha tACS. In the fourth experiment, we found that participants showed higher right temporal alpha power when generating more remote uses for common objects. These studies altogether indicate that right temporal alpha oscillations may support creativity by acting as a neural mechanism for an active inhibition of obvious semantic associations. Institutional Christianity has weakened drastically since the 1960s...The mainline-Protestant establishment is an establishment no more. Religious belief and practice now polarizes our politics in a way they didn’t a few generations back. ...perhaps instead of secularization it makes sense to talk about a fragmentation and personalization of Christianity...in which traditional churches have been supplanted by self-help gurus and spiritual-political entrepreneurs. ...a genuinely post-Christian future for America...the return of a pagan religious conception...A fascinating version of this argument is put forward by Steven D. Smith, a law professor at the University of San Diego, in his new book, “Pagans and Christians in the City: Culture Wars From the Tiber to the Potomac.” Smith argues that much of what we understand as the march of secularism is something of an illusion, and that behind the scenes what’s actually happening in the modern culture war is the return of a pagan religious conception, which was half-buried (though never fully so) by the rise of Christianity. ...What is that conception? Simply this: that divinity is fundamentally inside the world rather than outside it, that God or the gods or Being are ultimately part of nature rather than an external creator, and that meaning and morality and metaphysical experience are to be sought in a fuller communion with the immanent world rather than a leap toward the transcendent. ...you can build a plausible case for a “pagan” (by Smith’s definition) tradition in Western and American religion, which takes two major forms...First, there is a tradition of intellectual and aesthetic pantheism that includes figures like Spinoza, Nietzsche, Emerson and Whitman, and that’s manifest in certain highbrow spiritual-but-not-religious writers today. Smith recruits Sam Harris, Barbara Ehrenreich and even Ronald Dworkin to this club...Second, there is a civic religion that like the civic paganism of old makes religious and political duties identical, and treats the city of man as the city of God (or the gods), the place where we make heaven ourselves instead of waiting for the next life or the apocalypse. ...a practice of ritual and prayer of the kind that the paganism of antiquity offered in abundance. And that absence points to the essential weakness of a purely intellectualized pantheism..However, there are forms of modern paganism that do promise this help...the countless New Age practices that promise health and well-being and good fortune, the psychics and mediums who promise communication with the spirit world, and also the world of explicit neo-paganism, Wiccan and otherwise...To get a fully revived paganism in contemporary America...the philosophers of pantheism and civil religion would need to build a religious bridge to the New Agers and neo-pagans, and together they would need to create a more fully realized cult of the immanent divine, an actual way to worship, not just to appreciate, the pantheistic order they discern. This is the fourth installment of clips taken from "21 Lessons for the 21st Century," Harari, Yuval Noah. Kindle Edition, Random House Publishing Group. Part IV. My idiosyncratic choices of text reducing the contents of each chapter to a single paragraph miss many important points, and don't begin to replace a full reading of the chapter. Part IV - Truth - If you feel overwhelmed and confused by the global predicament, you are on the right track. Global processes have become too complicated for any single person to understand. How then can you know the truth about the world, and avoid falling victim to propaganda and misinformation? Chapter 15 - Ignorance - You know less than you think. If you are left with the nagging feeling that this is too much, that you cannot process it all, you are absolutely right. No person can…In the last few centuries, liberal thought developed immense trust in the rational individual…[which] may well be a chauvinistic Western fantasy, glorifying the autonomy and power of upper-class white men…behavioral economists and evolutionary psychologists have demonstrated that most human decisions are based on emotional reactions and heuristic shortcuts rather than on rational analysis…woefully inadequate in the Silicon Age… We think we know a lot (“the knowledge illusion.”), even though individually we know very little, because we treat knowledge in the minds of others as if it were our own…People rarely appreciate their ignorance, because they lock themselves inside an echo chamber of like-minded friends and self-confirming news feeds, where their beliefs are constantly reinforced and seldom challenged…The problem of groupthink and individual ignorance besets …also presidents and CEOs…great power inevitably distorts the truth. Power is all about changing reality rather than seeing it for what it is. Chapter 16 - Justice - Our sense of justice might be out of date. Like all our other senses, our sense of justice also has ancient evolutionary roots. Human morality was shaped over the course of millions of years of evolution to deal with the social and ethical dilemmas that cropped up in the lives of small hunter-gatherer bands…Most of the injustices in the contemporary world result from large-scale structural biases rather than from individual prejudices, and our hunter-gatherer brains did not evolve to detect structural biases…In previous eras …you weren’t responsible for the plight of people halfway across the world. If you made an effort to sympathize with your less fortunate neighbors, that was usually enough. But today major global debates about things such as climate change and artificial intelligence have an impact on everybody—whether in Tasmania, Hangzhou, or Baltimore—so we need to take into account all viewpoints. Yet how can anyone do that? How can anyone understand the web of relations among thousands of intersecting groups across the world?…we now suffer from global problems, without having a global community. Chapter 17 - Post-Truth - Some fake news lasts forever. A cursory look at history reveals that propaganda and disinformation are nothing new, and even the habit of denying entire nations and creating fake countries has a long pedigree.…humans have always lived in the age of post-truth. Homo sapiens is a post-truth species, whose power depends on creating and believing fictions…Ever since the Stone Age, self-reinforcing myths have served to unite human collectives. When a thousand people believe some made-up story for one month, that’s fake news. When a billion people believe it for a thousand years, that’s a religion, and we are admonished not to call it “fake news” in order not to hurt the feelings of the faithful (or incur their wrath)… For better or worse, fiction is among the most effective tools in humanity’s tool kit. By bringing people together, religious creeds make large-scale human cooperation possible.you cannot organize masses of people effectively without relying on some mythology… We learn to respect holy books in exactly the same way we learn to respect paper currency…Instead of accepting fake news as the norm, we should recognize it is a far more difficult problem than we tend to assume, and we should strive even harder to distinguish reality from fiction. Chapter 18 Science Fiction - The future is not what you see in movies. …perhaps the worst sin of present-day science fiction is that it tends to confuse intelligence with consciousness. As a result, it is overly concerned about a potential war between robots and humans, when in fact we need to fear a conflict between a small superhuman elite empowered by algorithms and a vast underclass of disempowered Homo sapiens…[Aldous Huxley’s “Brave New World” is]… the most prophetic science-fiction book of the twentieth century…Humans control the world because they can cooperate better than any other animal, and they can cooperate so well because they believe in fictions…The current technological and scientific revolution implies not that authentic individuals and authentic realities can be manipulated by algorithms and TV cameras but rather that authenticity is a myth. People are afraid of being trapped inside a box, but they don’t realize that they are already trapped inside a box—their brain—which is locked within the bigger box of human society with its myriad fictions. When you escape the matrix the only thing you discover is a bigger matrix…According to the best scientific theories and the most up-to-date technological tools, the mind is never free of manipulation. There is no authentic self waiting to be liberated from the manipulative shell. Since your brain and your “self” are part of the matrix, to escape the matrix you must escape your self. That, however, is a possibility worth exploring. Escaping the narrow definition of self might well become a necessary survival skill in the twenty-first century. This is my second installment of clips taken from "21 Lessons for the 21st Century," Harari, Yuval Noah. Kindle Edition, Random House Publishing Group. Part II. My idiosyncratic choices of text reducing the contents of each chapter to a single paragraph miss many important points, and don't begin to replace a full reading of the chapter. Part II - The Political Challenge - The merger of infotech and biotech threatens the core modern values of liberty and equality. Any solution the technological challenge has to involve global cooperation. But nationalism, religion, and culture divide humankind into hostile camps and make it very difficult to cooperate on a global level. …over the past two centuries intimate communities have been disintegrating. …Zuckerberg promised that Facebook would lead the charge to rebuild communities and that his engineers would pick up the burden discarded by parish priests. priests. .. “make it easier to build communities.”…in order to truly flourish it will have to put down roots in the offline world too…Humans have bodies. During the last century technology has been distancing us from our bodies. We have been losing our ability to pay attention to what we smell and taste….Humans … cannot live happily if they are disconnected from their bodies. If you don’t feel at home in your body, you will never feel at home in the world…this appreciation too has its downside...Once the tech giants come to terms with the human body, they might end up manipulating our entire bodies in the same way they currently manipulate our eyes, fingers, and credit cards. We may come to miss the good old days when online was separated from offline. ...a single political paradigm is accepted everywhere. The planet is divided between about two hundred sovereign states, which generally agree on the same diplomatic protocols and on common international laws….they share many more political ideas and practices than not, including at least a token belief in representative bodies, political parties, universal suffrage, and human rights…almost everybody believes in a slightly different variation on the same capitalist theme, and we are all cogs within a single global production line…the dollar bill is universally venerated across all political and religious divides…when it comes to the practical stuff—how to build a state, an economy, a hospital, or a bomb—almost all of us belong to the same civilization. Will we make a world in which all humans can live together, or will we all go into the dark? Do Donald Trump, Theresa May, Vladimir Putin, Narendra Modi, and their colleagues save the world by fanning our national sentiments, or is the current nationalist spate a form of escapism from the intractable global problems we face?…A common enemy is the best catalyst for forging a common identity, and humankind now has at least three such enemies—nuclear war, climate change, and technological disruption. If despite these common threats humans choose to privilege their particular national loyalties above everything else, the results may be far worse than in 1914 and 1939. Chapter 8 Religion - God now serves the nation. So far, modern ideologies, scientific experts, and national governments have failed to create a viable vision for the future of humanity. Can such a vision be drawn from the deep wells of human religious traditions?..No matter how technology will develop, we can expect that arguments about religious identities and rituals will continue to influence the use of new technologies, and might well retain the power to set the world ablaze. The most up-to-date nuclear missiles and cyber bombs might well be employed to settle a doctrinal argument about medieval texts…all of this really makes traditional religions part of humanity’s problem, not part of the remedy…humankind now constitutes a single civilization, and problems such as nuclear war, ecological collapse, and technological disruption can only be solved on the global level. On the other hand, nationalism and religion still divide our human civilization into different and often hostile camps. Chapter 9 Immigration - Some cultures might be better than others. Though globalization has greatly reduced cultural differences across the planet, it has simultaneously made it far easier to encounter strangers and become upset by their oddities…Do we enter the immigration debate with the assumption that all cultures are inherently equal, or do we think that some cultures might well be superior to others? Traditional racism is waning, but the world is now full of “culturists.”…culturism has a much firmer scientific basis than racism, and particularly scholars in the humanities and social sciences cannot deny the existence and importance of cultural differences…At present, it is far from clear whether Europe can find a middle path that will enable it to keep its gates open to strangers without being destabilized by people who don’t share its values. If Europe succeeds in finding such a path, perhaps its formula could be copied on the global level.